The Durban Theatre Community is saddened by the unexpected loss of theatre-maker and actor “Siso” Bongumusa Shabalala on February 10, 2018. He died unexpectedly after a short, hereditary illness. Born in February 13, 1986, Bongumusa is best known for working with his identical twin Musawenkosi “Gosso” on original theatre productions with a strong social theme. Much of their work also examined the notion of family and what it meant to be a twin. Siso was mostly the director and Gosso more often than not was the actor, but typically they directed and acted together. They performed their shows across South Africa, the US, the UK, the Netherlands, Mozambique and Wales. The twins went to Swelihle High School in uMlazi. They worked closely with Twist Theatre Productions and Eager Artists and ran their own community theatre mentorship and theatre-making company based in uMlazi, uMsindo Theatre Projects. As part of their legacy, a lot of their scripts are being staged by young theatre practitioners. They also formed a musical Rap due, “Twice” which was very popular. 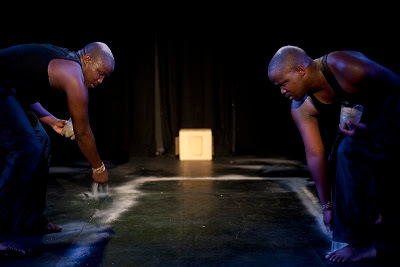 The twins worked on an impressive body of work together – starting with Peace in the Valley about 12 years ago, a production about the IFP / ANC conflict in Kwa Mashu in the 80’s. Bongumusa was the main character in this production. In 2012, they toured with the production Men’s World to Cape Town, Rotterdam, Belgium and Amsterdam. This production challenged how we think about men's role in preventing AIDS. In 2010, To Be Like This Rock put human trafficking and child slavery under the spotlight, and will be remembered as one of their most popular productions. The production initiated by the Umsindo Group went on to collaborate with Neil Coppen and Deb Lutge who directed the work. It was performed at the Goethe Institute in Johannesburg, at Isigcawu Festival and Musho! Festival before touring to Johannesburg and Bloemfontein. In 2011, it won an Ovation Award in Grahamstown. It was remounted in 2014 at the Uhuru Community Arts Festival. They also won an ovation awards at NAF for the production, Secrets of the Drawer, written by Neil Coppen. They acted both in Famished Road under the direction of Roel Twijnstra, which was performed in Durban, Bloemfontein, Joburg and Pretoria. Two noteworthy productions were created last year: Zulu King Cetshwayo: the Musical written and directed by Jerry Pooe about the Battle of Isandlwana which toured to Wales last August. Another highlight last year, was a project with acclaimed playwright Neil Coppen who worked with the twins on Izipopolo at the Loft last year as part of the Playhouse New Stages season. Izipopolo (which means ‘binoculars’ in isiZulu) is a moving and poetic 50-minute play that follows the journey of identical twin brothers Thabo and Thabani. The fable follows the twins from the moment they first meet in their mother’s womb, through to their difficult adolescence and coming of age in KwaMashu, near Durban. The play explores what happens when one of the brothers decides to forge an identity separate from the other, and whether or not it is possible for each to exist and function in isolation. “He was a friend to many and one of the very first members of the Twist family and part of the outstanding Durban duo of “the twins” who made great work and great waves in theatre in KZN. Musawenkosi Shabalala – all strength to you and your family and all of Siso’s loved ones. We cannot imagine what life will be like with one brother missing,” said Emma Durden and Roel Twijnstra of Twist Theatre Productions. There were many heartfelt tributes online: “You have all your duties fulfilled, in your heart there was no guilt. So you shall forever stay at ease and in the heavens above ... people think that to be strong is to never feel pain, in reality the strongest people are the ones who feel it, understand it, accept it and move on ...” says DUT drama graduate, Wiseman Mncube. “We have lost a soldier,” wrote performer Philisiwe Twijnstra. “I am stupefied that such a light is gone from our lives and the theatre world. What an extraordinary man. The devastation I feel is impossible to articulate. My love to all who knew and loved this kind and brilliant man,” said theatre-maker Neil Coppen. Bongumusa Shabalala leaves his four children, Olwethu, Sbonakalisi; Nkanyezi and Langa, and his siblings: seven sisters and two brothers, and his identical twin brother Musawenkosi Shabalala. There will be a Memorial at the Playhouse on February 15, 2018, at 13h00.